Penelope Adair, wife and partner of sleuth Barnaby Adair, is so hugely pregnant she can barely waddle, much less assist, when Barnaby is summoned by Inspector Stokes of Scotland Yard to help investigate the violent murder of a gentleman at a house party. Penelope insists that she and Griselda, Stokes's wife, receive reports to stay duly informed of their husbands' discoveries. But what Barnaby and Stokes uncover leads only to more questions. The victim had been thrown out of the house party days before, so why had he returned? And how did he come to have the famous Finsbury diamonds in his pocket? The threat of scandal looms for all those attending the house party - and the stakes are highest for the gallant gentleman who has spent the last decade in Africa striving to resurrect his family fortune so he can seek Lord Finsbury's daughter's hand. Working parallel to Barnaby and Stokes, can our would-be lovers find a clear path to expose the murderer, disperse the stain of scandal, and claim the love and shared life they now crave? A pre-Victorian mystery with strong elements of romance. A short novel of 39,000 words. Decidedly eccentric and fashionable Penelope Adair is attending the premier event of London's Season with her husband-sleuth Barnaby Adair, when a lady's body is discovered in the gardens, struck down with a finial from the terrace balustrade. Her family and the shocked hosts turn to Barnaby and Penelope for help. 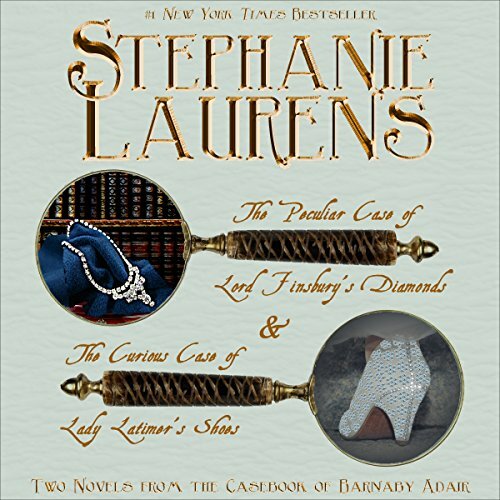 Barnaby calls Inspector Stokes while Penelope learns all she can about the victim's family; and uncovers a feud between them and the Latimers over a pair of mysterious and fabulous slippers, known as Lady Latimer's shoes. The deeper Penelope and her friends, Griselda and Violet delve, the more convinced they are that the murder is connected, a direction vindicated when unexpected witnesses report seeing a lady fleeing the scene - wearing Lady Latimer's shoes. The situation is compounded by a Romeo-and-Juliet romance, and escalating social pressure - until the pieces fall into place, and our intrepid investigators must race to prevent an even worse tragedy. A pre-Victorian mystery with strong elements of romance. A novel of 76,000 words. It's refreshing and to the point without too much to take us away from the plot. I was happy for that because I love the casebook mysteries of Barnaby Adair. Hoping that Stephanie brings out a series of such stories for our listening pleasure.